Maybe you have noticed? Fiddleheads Bagels are back! That's right, your favorite Asiago and Sun dried Tomato Bagels are stocked again. Like a phoenix from the ashes they have arisen and we placed another order this morning. Also arriving today or tomorrow is the house stud coffee, Bolivia, let loose your inner-jitters. 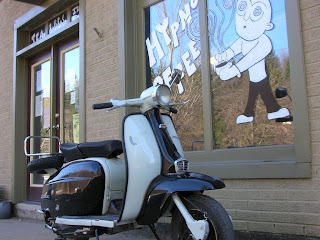 For the two (2) decaf drinkers, the very smooth and sweet Mexican Chiapas Decaf is also on the delivery truck. If you have to go decaf the Mexican Chiapas is the favorite. Congratulations to Jocelyn and Ryan on the birth of their son, Arden. Thirty (30)! hours of labor? You are a stud Jocelyn! The community is swelling with the resent additions and additions yet to come. Thanks for the photos Ryan, nice touch with the "stinkeye" comments. Abus should be here tomorrow for kitchen duties and we look forward to her company. The sunny spring days are putting the rays on us again, and I'm feeling a badminton game coming on. Any two (2) able body people (sorry Jeremy) are welcome to form a team and obviously sobriety and skills are optional, as evidenced by the HypnoTeam last week. If you are inclined to lawn sport competition than drop in the shop and I'll give you the details.